Are you in need of energy efficient air compressor? Hitachi has the options to choose from. Oil flooded screw compressors, piston compressors and oil-free scroll compressors from Hitachi offer users some amazing energy saving features. We’ve highlighted here some of them. 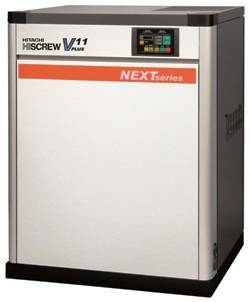 Screw compressors HiScrew Next are called “Next” for this particular reason – they belong to the next generation of screw compressors, combining outstanding energy savings with low environmental impact. Over ten years, the total oil consumption is reduced up to 85% thanks to lower oil capacity and consumption as well as the longer periods between oil changes. Airend of the variable speed drive compressor is of a unique all-in-one type, directly driven by a high efficiency motor with magnetic rotors. Thanks to the magnetic rotor, there’s no secondary current, and higher efficiency is reached comparing to induction motor + inverter. Cooling fan is controlled by inverter to achieve further energy savings. The VSD compressor models feature constant pressure control which maintains constant pressure at all times, without a pressure drop. This reduces pressure undershoot under fluctuating load situations and enables the minimisation of control pressure setting to reduce power consumption. The VSD model also has the ability to operate at 105% flow capacity or at higher pressure range and still be energy efficient. Hitachi increases the line pressure before automatically-stop to avoid the line pressure drop. Fixed speed compressors have load-unload capacity control allowing achieving energy savings. Further on, they can operate in so-called Ecomode, automatically reducing cut-out pressure, which leads to reduced additional power. In case two compressors are necessary, the best choice would be the combination of a VSD with a fixed speed compressor, allowing achieving the combination of lower initial investments and higher energy savings. The Hitachi multiplex oil less SRL compressor achieves energy savings thanks to two types of control available. Depending on the size (2.2 kW to 22 kW), Hitachi scroll compressors have one to four heads with extended life of the scrolls. Two modes of the operation offered are standard pressure control (similar to conventional pressure switch) and multi-drive control mode. Under pressure switch control (P-mode), compressor stops operating when reaching the maximum pressure, and restarts when the pressure drops to the specified recovery pressure. In multi-drive mode, operation of the compressor heads is modulated automatically, matching air supply to the need of compressed air. The delivery pressure is controlled by the quantity of the working heads, meaning that pressurising to the maximum pressure is not necessarily required and energy is saved. As an example, 15 kW unit, running at 50% capacity, will use 36% less energy compared to unload type. Finally, regular maintenance ensures the compressors operate at their best and save the maximum energy possible.